This weather themed cryptolist puzzle has letter hint to help start solving the puzzle. For each letter |F| that appears in the encoded list of words, substitute the letter |S|. 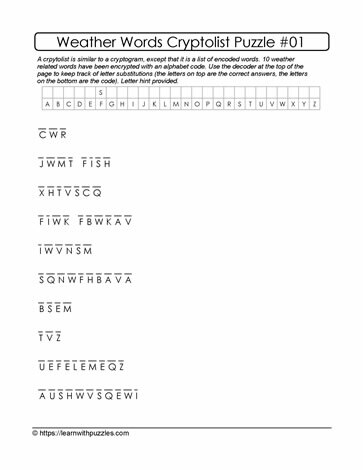 Knowledge of theme based weather words (or related global warming and climate change words), letter patterns and word structures will help to decode the cryptolist family of words. Puzzle is a great challenge for those who wish to engage the brain with a language based puzzle. Suitable also for students in grade 9 to grade 12, home schoolers and tutors supporting students outside the classroom.